A-HOTEL.com - Luxury and cheap accommodation in Korkino, Russia. Prices and hotel, apartment booking in Korkino and surrounding. Featuring a garden, Dom v prighorodie Sankt-Pietierburgha features accommodation in Vsevolozhsk with free WiFi and garden views. Guests staying at this holiday home have access to a fully equipped kitchen. В Питере жить 2 is located in Saint Petersburg and offers barbecue facilities and a terrace. This apartment is 7 km from The St. Located in Saint Petersburg, within 8 km of The St. Petersburg Masterskaya Theatre, Апартаменты Пражская is an accommodation offering city views. Featuring accommodation with a balcony, Eto Piter 3 is set in Saint Petersburg. The apartment, set in a building dating from 2018, is 7 km from the The St.
Apartments on Prazhskaya offers accommodation in Saint Petersburg, 7 km from The St. Petersburg Masterskaya Theatre. Located 13 km from Faberge Museum, 13 km from State Russian Museum and 14 km from Palace Square, Квартира offers accommodation set in Saint Petersburg. 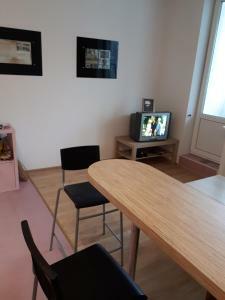 This apartment features accommodation with a balcony and free WiFi. Boasting city views, Apartment on Stolichnaya 4 is an apartment with a balcony, around 11 km from State Russian Museum and Church of the Savior on Spilled Blood. The apartment features living room with a TV, a well-equipped kitchen with a microwave and a fridge, and a bathroom with a bath. Located in Saint Petersburg, Европейский проспект 14 корпус 5 features accommodation with free WiFi and a garden with a barbecue and garden views. Each unit has a fully equipped kitchen with an oven, a seating area with a sofa, a flat-screen TV, a washing machine, and a private bathroom with bath and free toiletries. Set in Saint Petersburg, Европейский проспект 14 корпус 4 provides lake views and free WiFi, 7 km from The St. Petersburg Masterskaya Theatre and 13 km from Anna Akhmatova Museum. Situated 7 km from The St. Petersburg Masterskaya Theatre in Saint Petersburg, Apartment on Evropeysky 13 offers accommodation with a kitchenette.